Is there a better alternative to Legend Maker? Is Legend Maker really the best app in Word Processing category? Will Legend Maker work good on macOS 10.13.4? Legend Maker... Are you looking for an easy way to create ePub books for your iPad? Are you trying to make your books available for the Kindle? Are you spending too much time trying to properly format your books instead of focusing on writing? 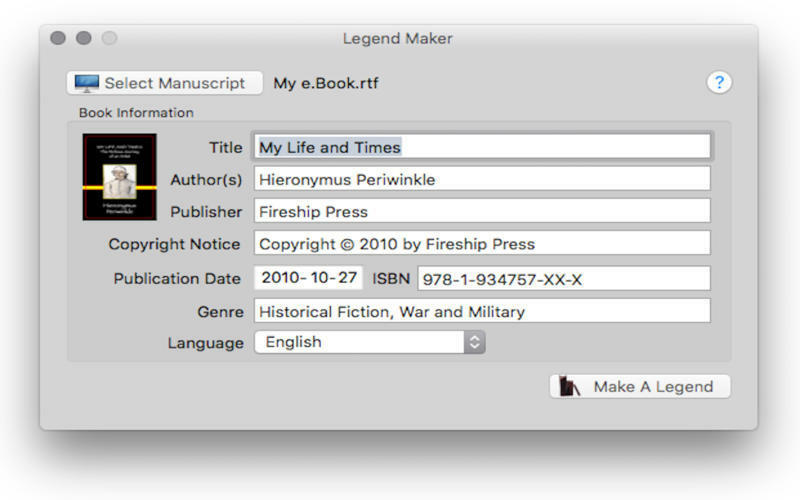 Legend Maker for Mac OS X takes all the hassle, confusion, and mystery out of creating perfectly formed ePub and Kindle books so you can do what you do best, write! Improved formatting of pop-up notes in ePub 3 books. Creating books for iBooks? With Legend Maker you can create books that look great on the iPad and iPhone. You can even create multimedia books with embedded audio and video - creating interactive texts has never been easier. With some simple additions to any Word or RTF manuscript (no HTML required!) you can create books that look great on the Kindle, iPad, Sony Reader, ibis reader, bookworm, and any other reader that supports the ePub standard.